Welcome to the Johnson Family Light Show!!! "This is the most freaking awesome light show I've ever seen! EVER"
"That was amazing, I wish MY neighbors were this cool!﻿"
"Best Christmas light show ever!﻿"
"Lol, humor and awesome music! I like! :D﻿"
"Wow! Wow! Wow!! Fabulous! It's so clean and perfect, well done.﻿"
"Great mix! I love the RGB's on the path and the way you synchronize them, very original.﻿"
"Hands down, one of the best displays.... thumbs up 100%!!!! 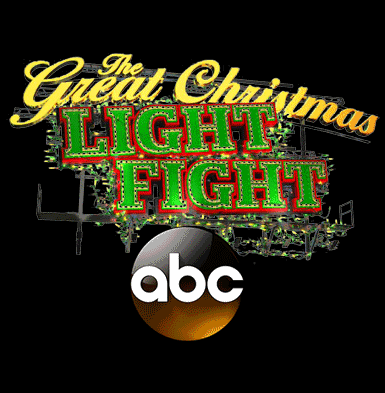 !﻿"
Started in 2013, our show is the first to be featured on ABC's "The Great Christmas Light Fight" TV series after only one year in existence. Our show is not your traditional light show! There are no inflatables, characters, blow molds, or other "traditional" elements. Even the music is not traditional Christmas music; it is a custom sound track composed of Dubstep, EDM, hip hop, movie clips and even our children! The result is an exciting show that feels like a dance party! Even the lights are not traditional, we use Pixels which are similar to what you would see in a stadium Jumbotron. 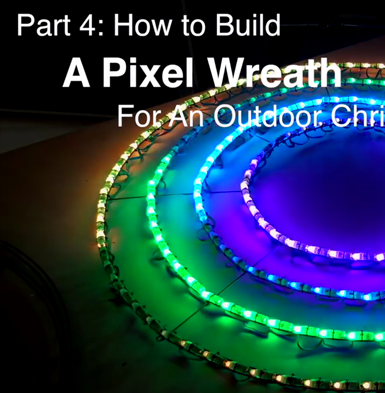 Each pixel can be controlled individually and set to any color and intensity. This means many more effects than what can be done with Christmas lights! The show embodies the spirit of DIY and cutting edge technology with all custom built elements, kit based controllers, and both custom and open source software. We hope you like our show, thanks for visiting! 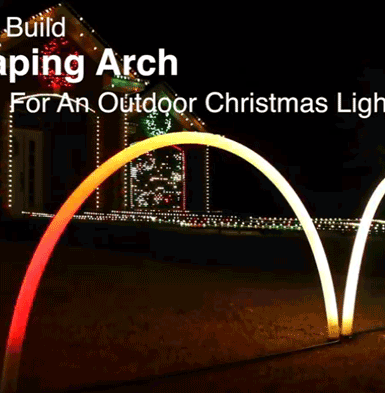 Click above to watch our 2015 light show. This was the last show at our home before moving to a larger venue that could handle the increased traffic. Make sure you select HD quality in the Youtube viewer options (click on the gear icon) and watch it full screen for the best effect! This year we added more elements, more music, and more effects. All Dubstep style! 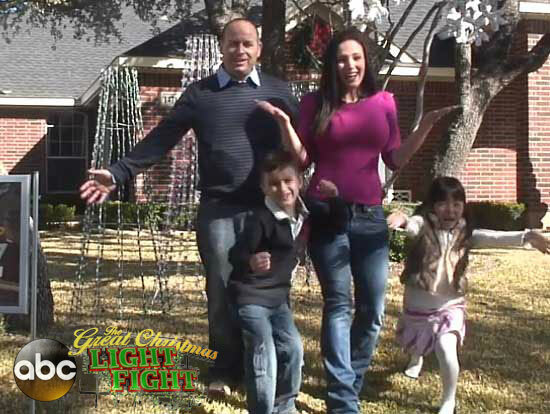 Promo of us on ABC's "The Great Christmas Light Fight"
Did you enjoy our show? If you enjoyed our show would you please share it with others? Click the ball below to post to your favorite social network. The following are questions that I am asked commonly, if you have a question not answered here, fill out the form and I will do my best to answer it! Yes! I just started a new business that year called Living Light Shows. You can view our products and services here: http://www.livinglightshows.com. What makes your display so unique? The primary difference is that rather than being a display, it is a 10 minute show. Many houses you will see have music that they sequence their lights too, but if you look closely you will notice that the effects are often limited to blinking to the beat. In our show, I have tried not to ever have two parts of the show that are exactly the same. In the same way that a composer attempts to isolate individual instruments when composing a work of music, I tried to isolate specific elements within the yard that represented every instrument, beat, sound effect, buzz, whirl, etc. when sequencing so the end product throughout the whole show is truly a visual representation of what you are hearing rather than just blinking elements to the beat. I also have attempted to visually represent parts of the music with lights that are especially signficant, such as moments of rising tension and bass drops. I feel this really invokes emotion in the viewer and makes the show that much more entertaining. A famous musician once said that every note has been played, but it is how an individual compiles those notes together than allows us to continually have unique and beautiful new music. 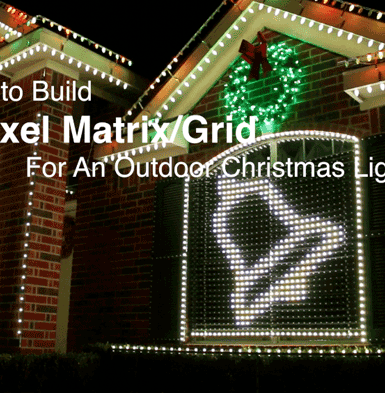 We have about 300-500 Christmas lights and 6,181 Pixels. My goal in 2015 is to have 100% pixels. How many extension cords do you use? TWO... What you say?! All pixels lights except for those powered off two 25 foot extension cords are running 12v over the same wire sending the signal to our pixels. How many Controllers/Channels do you have? 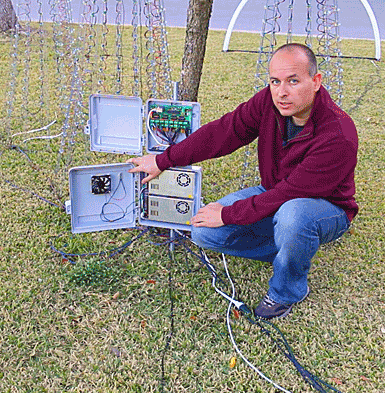 Traditional Christmas lights use an average of one to two controller channels per 100 lights. Our pixel lights use THREE HUNDRED controller channels per 100 lights. That means our controllers are pushing out the same "horsepower" as would be required for a show running nearly TWO MILLION traditional Christmas lights! We use 6 SanDevices e682 controllers to run all our lights. What do you think is your coolest effect? 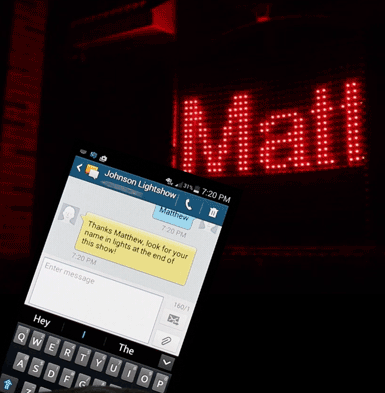 In 2014, I wrote a custom software interface that allows viewers to send a text message of their name from their cell phone and it will scroll the name across two of our large pixel Jumbo-tron grids in 4 foot letters for everyone to see! This is a level of interactivity and technology we have never seen on any other house and has a great “cool” factor for the public since it makes them part of the show. What do you do for a living? is this just a hobby? I get various forms of this question, but the short answer is I do Technology Consulting and Software Development for a living. I do not do anything like this as part of my job. I do enjoy the marrying of software to electonics though and this is a good outlet for that. If you or anyone you know has a business requirement or inefficiency within your organization that you would like me to look at and see if we can resolve utilizing some form of technology (Software, Automation, etc.) then please contact me using the form below. I am also always interested in making new business contacts on LinkedIn as well, so please click here if you would like to connect! How long does it take you to program the lights? Depending on how natural the creativity is flowing, I would say I average 6-10 hours of sequence programming for every 10 seconds of finished show. What software do you use to make your custom sound track? I use an open source audio editor called Audacity. 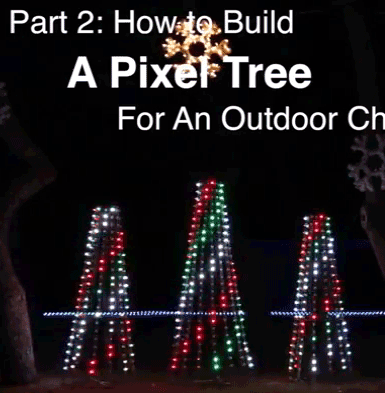 What software do you use to sequence the lights? I use an open source software product called Vixen 3. How big of a computer do you have to have to run this show? I actually do not use a computer at all. Starting in 2014, my entire show is ran from a Raspberry Pi. The Raspberry Pi is a single board computer with no moving parts about the size of a credit card. I run software on it called the Falcon Pi Player. This product is an amazing technological acheivement. Using the Pi, I am able to run nearly 3 times the number of channels in my show than I was able to do with a Windows PC with 8GB RAM in 2013. What is really amazing about the Raspberry Pi is that it was invented by a professor at the University of Cambridge in the UK as an educational tool for children and only costs $35. What is one intersting fact about the technology in your light show? Our entire 10 minute light show and sound track are stored on a memory chip the size and thickness of your finger nail. You must have a ridiculous power bill, how much does it cost to run your show? Another testament to the latest technology is that my show is EXTREMELY energy efficient. How efficient? The whole show requires HALF the power required to run a standard household hair dryer! Our show is approx. 742 watts, a hairdryer uses 1440 watts. Our 2014 show is 10 minutes long. The entire show is on Youtube, it is not just a portion of it. Matt’s passion has always been technology. 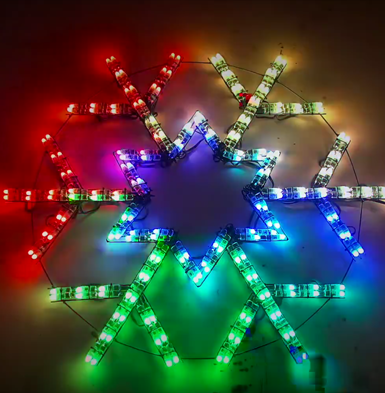 His light show is just one of the numerous practical applications of the technological disciplines he has been dabbling with in recent times. These disciplines have resulted in various business ventures and R&D projects over the years. 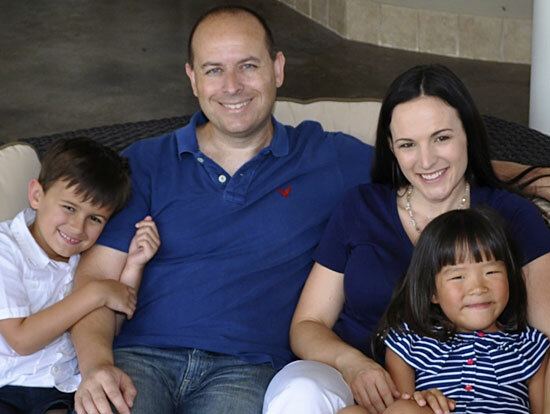 In his professional life he provides technology consulting and software development solutions to help businesses achieve new levels of efficiency and success. His creativity, experience, and well-rounded knowledge of all aspects of technology and business operations have helped his customers recognize new cost savings and gain competitive advantage across a broad spectrum of industries. Starting in 2016 Matt has started offering his services and the product designs he has created for light shows for sale. You can view them at http://www.livinglightshows.com. Matt is always looking to expand his professional network, hear new ideas, and meet new people, and would like to invite you to connect with him on LinkedIn. Melissa is the creative mastermind in the family. She benefits from many complimentary gifts such as strong communication, cognitive bilateralization, and superior presentation skills. Her analytical side is passionate about math education and training for parents and teachers using cutting edge mathematical concepts and presentation mediums. She has recently leveraged her experience as a successful seminar presenter and staff trainer in mathematics education for school districts into a new project called Monstermath.org. Monster math provides training resources for parents and teachers in math standards such as STAAR and Common Core. If you are interested in engaging her services for curriculum development, presentations, or other training, she would love to hear from you. As for her creative side, she loves interior design, decorating, and DIY projects. She is currently working on a new project called "My Well Designed Life" that provides tips and resources for organizing and balancing the various areas of your life including interior design, food, fitness, faith, and family. 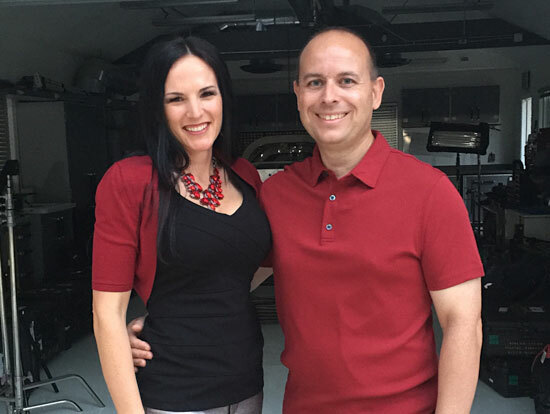 Melissa is always interested in new projects, relationships, and opportunities and would love to connect with you on LinkedIn.